Supercomputing is an essential part of modern science and engineering. With 74,240 cores at work, the Joule Supercomputer at NETL gives researchers broad access to predictive simulation capabilities. This resource fuels innovation in the energy sector bringing increased energy supplies, lower costs and improved efficiencies. With Visualization Centers at all three NETL sites, researchers can easily work together remotely and achieve results faster. Each center features tile displays, large screen LCD’s and collaborative workstations, and high speed access to high memory visualization nodes for visualization and post-processing. MFiX is a general-purpose computer code developed at the National Energy Technology Laboratory (NETL) for describing the hydrodynamics, heat transfer and chemical reactions in fluid-solids systems. The code is used as a "test-stand" for testing and developing multiphase flow constitutive equations. Researchers at the Office of Fossil Energy’s National Energy Technology Laboratory are using the Joule Supercomputer to learn more about the chaotic chemical reactions that occur in the coal gasification process. Secretary of Energy Moniz commemorated the Joule Supercomputer during his visit to NETL by signing "Good Work, Ernie Moniz". 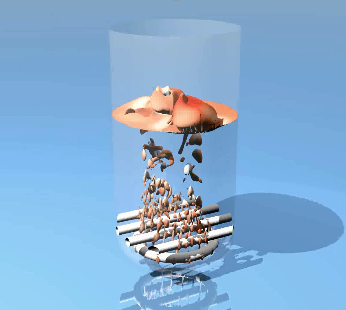 NETL’s Molecular Science competency provides technology-enabling computational and experimental insight into the atomic-level processes occurring in condensed matter and gas phase systems or at the heterogeneous surface-gas interfaces used for energy applications.